The plan to cut Americans' 401(k) contributions is also known as "Rothification" and helps offset what the government loses in tax revenue. Maybe it's just misunderstood. Republicans hoping to pass a tax reform bill this year are searching for ways to offset trillions of dollars in potential corporate and individual tax cuts. And one such way, which has been floated since at least April, is something called "Rothification." Under current law, some 132 million workers contribute to a 401(k) or similar plan on a pre-tax basis. These deferred wages, or what the IRS calls elective deferrals, are generally not subject to federal income tax withholding at the time of deferral. But distributions are taxed as ordinary income. Now, truth be told, this tax deferral costs the government money in the short term. In fact, defined contribution plans will cost $583.6 billion in forgone tax revenue between 2016 and 2020 and traditional IRAs will cost $85.8 billion, according to the most recent numbers from the non-partisan Joint Committee on Taxation. If, however, the government caps the amount workers can save on a pre-tax basis but lets them continue to save with after-tax dollars, it will recoup some of that foregone tax revenue. Or at least that's the idea behind the House Republicans latest plan to limit the amount workers can save in their 401(k) to $2,400, from its current level of $18,000, or $24,000 for those age 50 and older. To be fair, the most recent Rothification plan was dead on arrival. Among other things, the plan contradicted the stated goals of the Trump administration's and Republicans' Unified Framework for Fixing Our Broken Tax Code. That document states that tax "reform will aim to maintain or raise retirement plan participation of workers and the resources available for retirement." So, why did Republicans float a dead-on-arrival idea? To make the tax cuts work over the budget-scoring window. "As I understand it, the plan would limit the upfront tax deferment to $2,400, then anything above that amount would get Roth treatment," said Andrew Biggs, a resident scholar at the American Enterprise Institute (AEI). Contributions to a Roth 401(k) or Roth IRA are made with after-tax dollars. According to Biggs, the motivation for the plan to cap pretax savings has very little to do with retirement policy, which GOP lawmakers, he noted, unfortunately don't think very much about it. "The idea is that by shifting to a Roth treatment of contributions, you'd get more revenues up front which would help pay for the tax cut over the budget-scoring window," he said. "You don't get more total revenues over the long term, meaning -- that the policy doesn't really cut 401(k) subsidies, nor does it make the tax cut more affordable, because 401(k) balances would become tax-free on withdrawal. Basically, it's just a way to front load tax revenues to make the short-term budget figures work out." In theory, the results need not be bad, said Biggs. "The overall tax treatment under Roth is basically the same as with regular contributions, you simply get the tax break later," he said. "While some people do better under regular treatment, others do better under Roth. On average, it's pretty similar and the differences from person-to-person aren't huge." Moreover, Biggs said, research seems to find that when 401(k)s switch to Roth treatment, employees maintain more or less the same contribution rates. "That means an increase in net contributions equal to the average marginal tax rate," he said. "So in theory, a Roth switch could increase retirement saving, especially to the degree that contribution rates in the future will be driven by auto-enrollment." Of course, not all agree with Biggs' assessment. Research earlier this year from the Investment Company Institute (ICI), the lobbying group for the mutual fund industry, found that Americans strongly value the current tax incentives for retirement saving and overwhelmingly oppose changing them. In the study, American Views on Defined Contribution Plan Saving, 2016, ICI found that 89% of all U.S. households disagree with the statement that the government should take away the tax advantages of defined contribution (DC) accounts, and 90% disagree with the idea of reducing the amount that individuals can contribute to DC accounts. Even among households that do not own DC accounts or individual retirement accounts (IRAs), 82% reject the idea of taking away the tax treatment of DC accounts. Given that, Biggs said, people interpret the Roth switch as getting rid of the tax deferment. "A lot of public discussion and media headlines get this wrong," he said. "To counter that, the proposal would allow regular tax treatment on contributions up to $2,400. That helps a bit with the optics, and in reality, very few people -- and almost no low-earners -- would be affected." Biggs noted, for instance, that 85% of people with incomes under $50,000 wouldn't hit that cap. "But if you think the current tax treatment is regressive, the cap makes some sense; it's high earners who'd be affected," he said. But together, Biggs said he's not sure how well it works. "Those people who do save more than $2,400 may take that figure as a cap and reduce their saving, even if they could benefit from the Roth treatment," he said. "Moreover, if bosses or human resource managers who decide whether a firm sponsors a plan don't like the cap, they may be less willing to have a 401(k) for their employees." Bad Optics or Bad Policy? On paper, it's not a terrible policy, Biggs said. "But I think it gets screwed up by the budgeting and the politics," he said. "My big-picture political complaint for the GOP is that it often looks as if they care more about tax cuts for people at Mitt Romney-income levels than they do about ordinary people, say, middle class people saving for retirement. Even if that's not actually the case with this policy, it reinforces that view." Others, meanwhile, say Rothification is not just bad optics but bad policy, too. In September, for instance, Sen. Sherrod Brown (D-Ohio), promised "one hell of a fight" if tax reform negotiators consider shifting retirement savings tax incentives to Roth accounts instead of 401(k) plans, as a way to pay for corporate tax cuts. And in July, the American Benefits Council wrote to Senate Finance Committee Chairman Orrin Hatch (R-Utah), suggested that Rothification was inconsistent with its 10 principles for a national retirement savings policy. "Americans' retirement savings should not be viewed by policymakers as a 'piggy bank' to pay for other tax priorities," James Klein, the president of American Benefits Council, wrote at the time. "Rather than taxing contributions to retirement plans, we should be encouraging individuals to invest in their future, which is good for taxpayers and the nation's economy." Who Is Affected by Rothification? So, what percentage of 401(k) contributors would likely be affected by the $2,400 threshold and what is the percentage of 401(k) employee contributions that would be above $2,400 and thus subject to mandatory Rothification? According to the Employee Benefit Research Institute (EBRI), even at the lowest wage levels ($10,000 to $25,000), 38% of the 401(k) contributors would be affected by the $2,400 threshold. This number drops slightly for those with wages of $25,000 to $50,000 but then increases substantially. For those with more than $100,000 in wages, 87% would be affected. 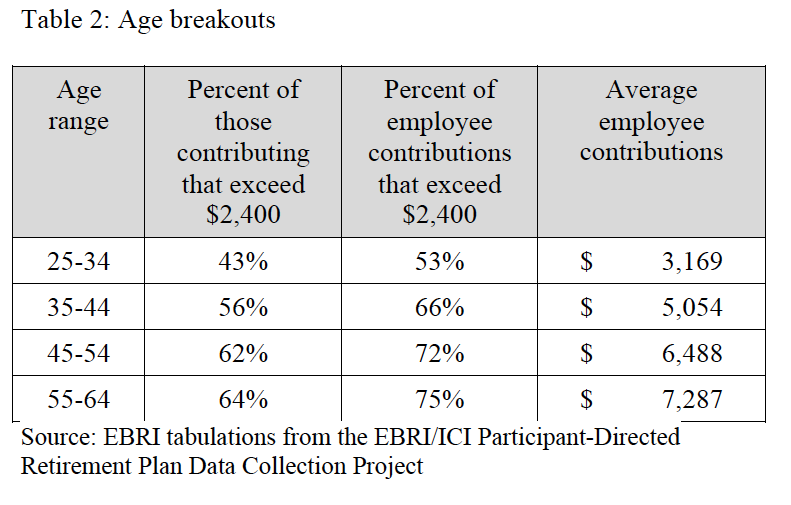 EBRI also examined the percentage of 2015 contributions that would be impacted by the $2,400 threshold. It found 58% of the contributions from 401(k) contributors at the lowest wage levels ($10,000 to $25,000) would be above $2,400 and thus subject to mandatory Rothification. This number drops slightly for those with wages of $25,000 to $50,000 but then increases substantially. For those with more than $100,000 in wages, 80% would be affected. EBRI also found 43% of the youngest 401(k) contributors, those ages 25 to 34, would be affected by the $2,400 threshold. This number increases for older participants. For instance, 64% of those ages 55-64 would be affected. 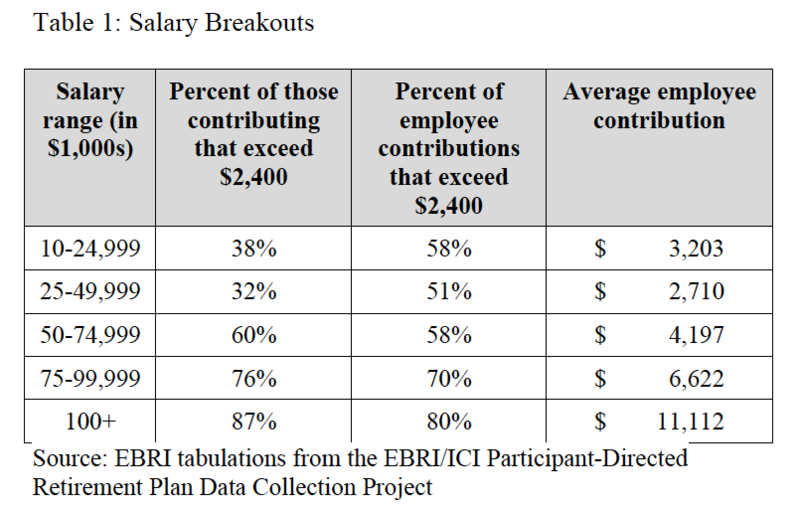 EBRI also found that the percentage of 2015 contributions that would be impacted by the $2,400 threshold. For the youngest 401(k) contributors (ages 25-34), 53% of the contributions would be above $2,400 and thus subject to mandatory Rothification. This number increases for older participants. For those ages 55-64, 75% of the contributions would be subject to mandatory Rothification. Financial advisers who work with those saving for retirement say there are some notable downsides to the Rothification of 401(k) plans and such plans could adversely affect your retirement. For one, few Americans understand Roth 401(k) accounts. For instance, two out of three retirement savers have either no understanding or a mistaken understanding of Roth 401(k) contributions, according to recent research from Cerulli Associates. Despite that lack of knowledge, there is a growing set of workers who are keen on the idea of Roth 401(k)s, according to a recent report on the subject by Rob Austin, director of research at Alight Solutions. Read Tax now or tax later? The 'Rothification' of 401(k) plans. Still, advisers including Jeff Carbone, a managing partner for Cornerstone Financial Partners, said one of the biggest issues or concerns he has with Rothification is that investors have grown comfortable with the tax benefits or deduction a 401(k) or a deductible IRA offers. "We change that without giving one a choice, the savings rate of Americans will decline," he said. "As we know, if one contributes to the 401 in the before-tax account, their income is decreased by that amount lowering the taxable income for the current year. If we change the deduction and income is taxable in the year received, that may affect one's ability or inclination to save ... They may feel 'I would rather use the money today,' or, if it is taxable, they not be able to save as much in the plan," Carbone said. "We are a want-it-now society and have been taught, rightly so, that the tax benefits of the 401(k) are great," he said. "Take that away and delayed gratification of tax-free income may not be enough especially for the millennial generation."